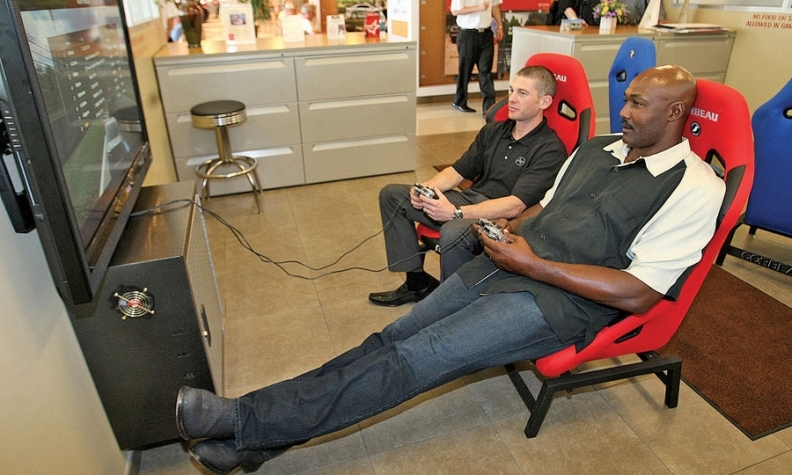 Looking for Karl Malone at his Toyota store? Don't try the office. He's out signing autographs, in the back shop or maybe playing video games with a service customer. For former professional basketball star Karl Malone, selling Toyotas amounts to selling ... well, Karl Malone. His Karl Malone Toyota in suburban Salt Lake City is installing a 100-foot sign that will tower above a nearby freeway and feature three Jumbotron-like screens for promotions. The second floor of the store is a sports and entertainment museum. It contains the only complete sets of U.S.A. Olympic basketball uniforms worn by Malone and his teammates as part of the "Dream Teams" of 1992 and 1996. The store has an arcade and game room for kids. Then there are computer screens that keep customers posted on the status of their service and repairs, much like the screens detailing flight information at airports. "We call him Disneyland Dad," says Andy Madsen, Malone's longtime lieutenant and COO. "When Karl shows up, the party is on." Malone, 48, who was coaxed into car retailing in 1994 by auto retailer Larry Miller, says he has grown to love the business. Today he is majority owner of Karl Malone Toyota, which sells about 300 new and used vehicles per month. Malone is the National Basketball Association's second-highest all-time scorer. He spent 18 seasons with the Utah Jazz and Miller, who owned the club in addition to heading the Larry Miller Group of auto dealerships. Malone was nicknamed The Mailman because he delivered winning season after winning season for the Jazz with a deadly jump shot, fierce rebounding and cold-blooded free-throw shooting. He spent his last NBA season with the Los Angeles Lakers and retired in 2004. Malone has been fully engaged in car selling since 2010, when he and Madsen bought out the Salt Lake City Toyota store from Larry Miller Group. Malone loves being with customers, Madsen says. He personally handles fleet sales to the oil-service businesses located three hours east in Vernal, Utah. Malone has friends throughout the businesses and loves owning and operating large diesel machinery, Madsen says. At the store, Malone is famous for glad-handing customers and taking them back to the service bays to check on the progress of the work, Madsen says. Madsen says he occasionally shakes his head at Malone's operating style. He says Malone has intervened to help employees financially when he learned of a hardship. "That's not the classic way to run a business," Madsen says. Malone may be a soft touch in some instances, but there's no doubt he is the boss, Madsen says. For instance, Malone insisted that the store install customer and employee suggestion boxes in the sales, service and parts departments. It was from those boxes that a customer complained about not knowing the status of a repair. In response, Malone had the electronic status boards installed around the store, Madsen says. Malone also confesses to other unorthodox selling methods. On Sundays, when there are no employees around, Malone leaves the inventory lots open and all the vehicles unlocked so window-shoppers can get behind the wheel if they want. "People love to shop after church when there's nobody around to interrupt them," Malone says. "We've replayed the video [surveillance cameras] of people shopping on Sunday and coming in the next day to buy a car." Owning a car dealership, even at Larry Miller's prodding, was the last thing on Malone's mind during the early part of his playing career. He says he thought it was a patently uncool thing to do in 1994. "You know, being a car dealer, there was a stigma," Malone says. But Miller, a dealer extraordinaire, kept bugging Malone to invest in the business. After ignoring Miller's invitations for months, Malone had his eyes opened by a post-game bucket of cold water that Miller dumped over Malone's head as Malone showered in the Jazz locker room. "We had just won a big game and Larry came to me in the shower. He says, 'I need to talk to you,'" recounted Malone. "Well, I wasn't interested in talking. I had soap on my face and everything. Next thing you know, I feel that cold water on my back." After the chilly drenching in 1994, Miller gave Malone just two days to hand over $250,000 as a down payment on a store. A few days later, Malone and Larry Miller Group bought Garcia Toyota in Albuquerque, N.M., and changed the name to Karl Malone Toyota. In 1997, Malone worked with the Miller group to open Karl Malone Toyota in Salt Lake City and he was an investor with former teammate and Hall of Famer John Stockton in Stockton to Malone Honda in Sandy, 15 miles south of Salt Lake City. Malone was largely a passive investor in the three Larry Miller Group stores from 1994 through 2004. While Miller was alive, Malone says he was happy to concentrate on basketball and let Madsen manage his Salt Lake City store with the assistance of Larry Miller Group affiliates. But as Malone became increasingly involved in the business, especially after retiring from the NBA in 2004, he says he realized it was a lot of fun. "They tell you at rookie camp that your basketball career is going to end some day and you have to prepare for life after that," Malone says. "I'm telling you the car business, done right, is something you can do the rest of your life and pass it on to your kids." When his friend and mentor Miller died in 2009, Malone got an itch to run the show his own way without the corporate oversight of the Larry Miller Group, Madsen says. An idea was hatched and executed in 2010 that allowed Malone to trade his equity in the Albuquerque store for all of Karl Malone Toyota in the Salt Lake City suburb of Draper, including 22 acres of real estate. Malone also sold his equity in Stockton to Malone Honda, now called Stockton 12 Honda and majority owned by Stockton. That's when Malone's boisterous and fun-loving personality began to flavor the business, Madsen says. Malone flies to Salt Lake City twice a month from his home in Louisiana to run the show. It's as though a Tasmanian devil had been invited in, Madsen says. Malone walks through the store catching up with employees, signing autographs for customers or stopping by the arcade to play a few video games with the kids. It fits perfectly with an outsized personality that matches his 6-foot-9-inch physique. But Madsen says Malone is really about offering customers an experience that leaves them happy and brings them back with their friends. "Honestly, Karl will spend two hours talking with everybody in the store before I know he's even arrived," Madsen says. Marketing and operations have changed dramatically outside of the corporate umbrella of the Larry Miller Group, Madsen says. For one, the store can offer more options from Toyota on financing and extended warranties now that it no longer is encouraged to use only those products and services provided independently by Miller's ancillary businesses, Madsen says. Before the buyout, lots of marketing dollars went to Miller-affiliated businesses, such as buying tickets to Jazz games or racing events at a locally owned racetrack, he says. Larry Miller Group declined to comment about Karl Malone Toyota. Malone is in the middle of most of the store's marketing initiatives. He insisted that the store have the huge outdoor sign, for which a zoning variance was required, Madsen says. Malone's TV commercials feature him talking to the audience from a Jumbotron. For a sample commercial, see autonews.com/malone. Malone also gets the Internet, Madsen says. Since the buyout, the store has shifted $25,000 of its $110,000 monthly advertising budget to digital marketing, including Google paid search. That compares with $6,000 a month previously, he says. Malone has broken ground on a $3 million body shop, Madsen said. And he wants to put aside six acres for a separate "credit rebound center." That's where shoppers with subprime credit can get personal treatment as they seek to buy a new car, Madsen said. The center, which Malone wants to open in spring 2014, would offer customers advice to fix their credit and personal finances, he said. Said Madsen: "Karl wants this place to be a family experience." Malone says he eventually intends to build a home in Salt Lake City. But Madsen says that will have to wait a few years. The youngest of Malone's three daughters is still in high school in Louisiana. And his son, Karl Jr., a high-school offensive lineman, recently committed to play football for Louisiana State University after he graduates next year. His son is even bigger than his dad. Another daughter played professional basketball in the WNBA. Meanwhile, Malone's frequent stopovers are certain to entertain. He says: "Originally, I didn't want to be involved in the car business. But athletes are really missing out on an unbelievable opportunity."